After writing my notes on Guinness in bottles and cans, I was mindful that another version of the black brew, Guinness Special Export Stout, may still be – and clearly was at one time – brewed from a 100% barley malt mash. Probably the components were/are pale malt and black malt or, pale malt, caramel malt and black malt (which would be better). This online discussion from 2012 about different forms of Guinness seems to confirm that Special Export Stout was all-malt then. Whether it is today, I can’t say. I had it last in Paris about 5 years ago, and found it rather thin and very similar to Guinness Extra Stout except stronger. However, from 20 years ago, I recall Special Export Stout being very good, rich and fruity. 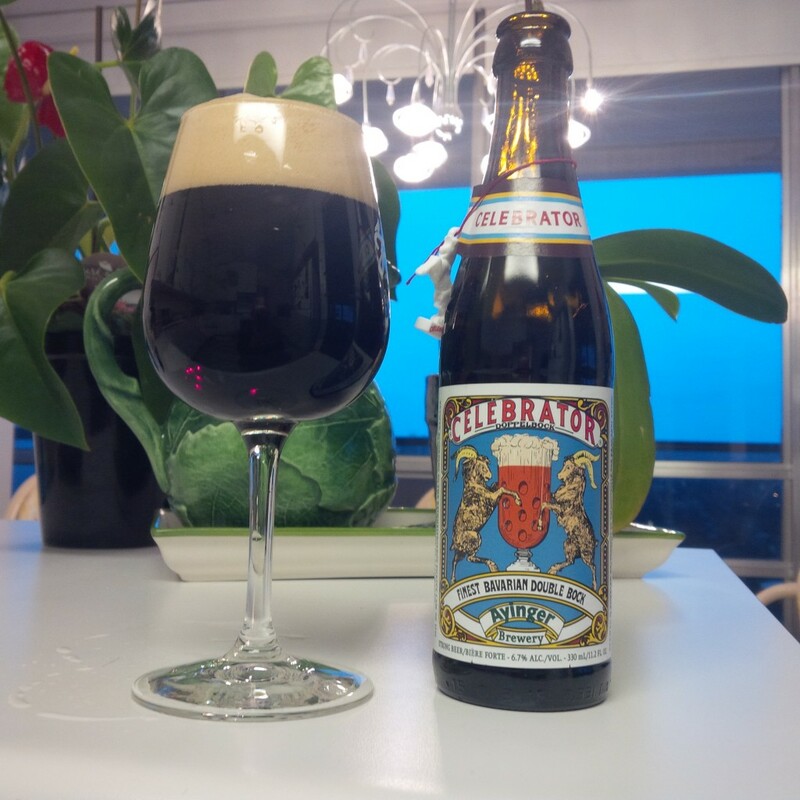 Older reviews on Beer Advocate and Ratebeer, the online rating forums, confirm that recollection. What I had in Paris 5 years ago, bought in a discount food store chain, conceivably might have been different from what is sent to Belgium as Special Export Stout. Belgium is important because the John Martin importation agency of that country recites a history on its website that a different form of Guinness was wanted for that market than was being exported, this during WW II, unlikely as it sounds. 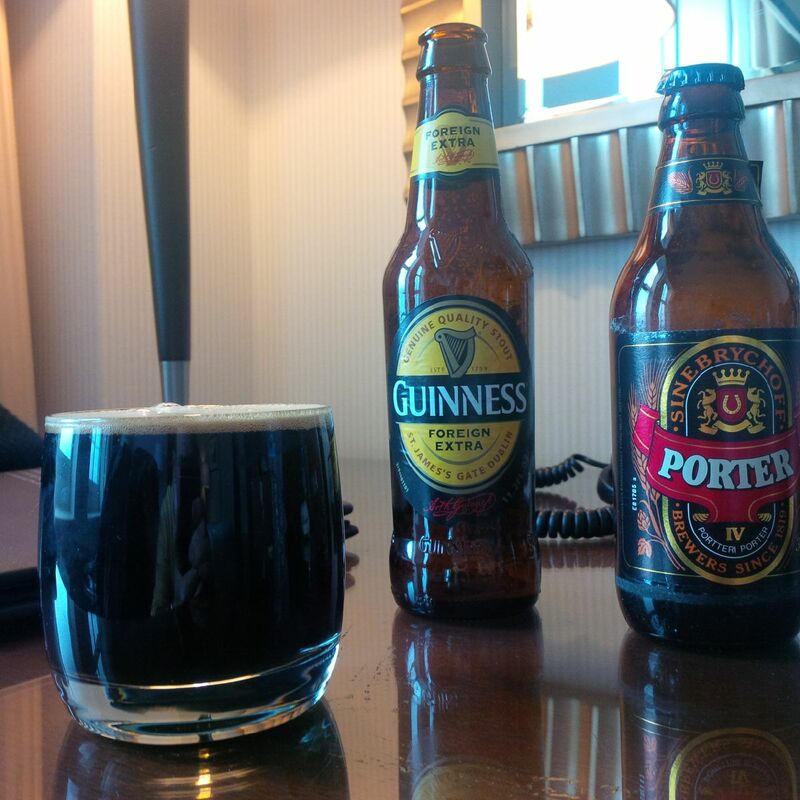 Guinness sent them what is called now Special Export Stout. I should add my own reading suggests it wasn’t really new but had roots in an older form of Guinness sent to the Continent, but that is neither here nor there. Guinness’s own website calls Special Export Stout “sweeter”, which suggests more malt is used than the other brews get, and maybe 100% malt again. This link from the Guinness website shows a picture of the current bottle and a description of the taste. Therefore, Special Export Stout, if still all-malt, is – like the adjunct Foreign Extra Stout which is soured with a dash of matured beer – a vestige of 19th century brewing practices at St. James’s Gate, Dublin. The mashbill of Special Export Stout could therefore be the basis of a restored, pre-adjunct draft Guinness Porter and Stout. The hop rate is apparently fairly low, but if the rate was kept as is and the original gravity dropped to 1055 or so, you could get probably a very credible version of 1800’s Guinness Porter. Keep the gravity as is and boost the hops, and you will get closer to Guinness Extra Stout (aka Double Stout, Double Porter, etc.) in its classic era. Once again, addition of unfermented wort – the extract of the mash boiled with hops but not yet fermented into alcohol – to a blend of fresh stout and some matured would enhance the credibility of the restoration. But anyway, the point being, Guinness Special Export Stout in Belgium at any rate may still be all-malt. If anyone reading knows for sure, pray tell us. 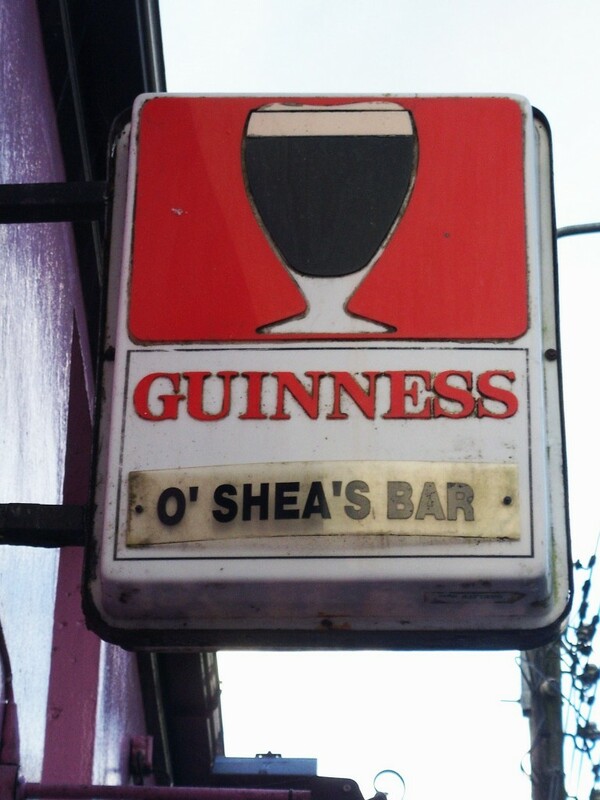 Guinness in its history made beers under many names, which often were synonymous, for example, single stout and porter were used at different times to mean the same beer. Indeed, Guinness over the years has continued to make a surprisingly large number of beers. Most don’t last long in the market and seem variations on the theme of the main types (extra stout, widget stout, draft Guinness, Foreign Extra Stout). From the standpoint of the advised or craft-oriented consumer, I’d suggest the key questions for both top quality and historical authenticity are: is the beer pasteurized (and if so, how); is the beer filtered; is the beer an adjunct beer; is the beer as highly hopped as possible; and does the beer exceed about 70% attenuation. The closer one gets to answering the first three of these, “no” and the last two, “yes”, the more the chance is the beer will hew close to its 1800s roots. One might add, use of wooden vessels and unfermented wort for conditioning are requisites too. But there is a limit to how far any restoration project is likely to go. I’d give up on the latter two if I could get the others. Bottle (Or Can) Of Guinness? Daresay I Will. In recent postings I gave my thoughts on the famous beer of Ireland as they relate to draft Guinness. Here are some ponderings on the various bottled and canned forms available in the market today. Historically, it was necessary to distinguish reaction to draft and bottled. The bottled beer called Extra Stout was, until the 90’s in England and about 2000 in Ireland, unfiltered and unpasteurized beer. In this sense, it harked back to an earlier time in the brewery’s history, when all its beer was sold this way. As explained earlier, the company turned what had been a cask beer into a pasteurized and gas-charged keg draft. Guinness fans thus looked increasingly to the bottled Extra Stout for the “real thing”. An interesting feature of Guinness is that all bottling until quite late in the company’s history was in effect contracted out. Guinness sent the beer out in bulk form and it was bottled by local companies in the different regions of England, say. In Ireland, bottling was often done by the pubs themselves, in the cellar. Inevitably, inconsistency resulted and finally the brewery took all bottling in, preserving for a time the tradition of natural-conditioning in bottle. I remember the beer on trips to the U.K. in the 80’s and 90’s. It was very good with a characteristic earthy (yeasty) note and a definite touch of bramble-like fruit. The dark fruit, or estery, note is very old in porter-brewing. As far back as the 1700s and 1800s beer manuals noted the characteristic in matured porter or advised to add elderberry wine to young beer emulate it. George Watkins advised the wine route in his brewing text of 1760, for example. I’ve tried it and it does produce something like a winy old beer, the characteristic a 1921 taste report on Guinness likened to a rare old vintage wine. Even in 1990 say in London and probably Dublin, only bottled Extra Stout still received this historical deference. The canned stuff and any bottled too sold in off-license retail (vs. pubs) carried filtered and pasteurized Extra Stout. Finally, all bottled forms became pasteurized, sold in the pub or not. Guinness gave as a reason for pasteurizing the bottled Extra Stout that with warmer central heating, the beer would mature too fast (spoil) before sale and it needed to be stabilized by pasteurization and filtration to be saleable within a 9 month window. The background is explained here in a detailed study of the history of bottled Guinness by ex-Guinness brewer David Hughes. Personally I find the explanation unpersuasive, as many modern craft beers are unfiltered and easily last 9 months and more. However, a factor may have been that this Extra Stout was under 5% abv. Modern craft beers are generally higher so the extra alcohol may preserve them for longer – and they probably on average are hopped more than Guinness. Hops preserve beer from souring at least for a time. Be that as it may, the last vestige of “real ale” Guinness disappeared when the brewery ceased to offer naturally-conditioned Guinness in the bottle. The later-introduced “widget” or nitro system canned and bottled Guinness (shaped bottle), an emulation of the nitro-draft dispense, is all pasteurized. Guinness Foreign Extra Stout, the well-known strong Guinness which has some features of 1800s Guinness, has been pasteurized since the late 1940s. It’s a decent beer, I just had some in New York, but doesn’t attain to the complexity and wine-like characteristic of the best matured porter and stout, IMO. 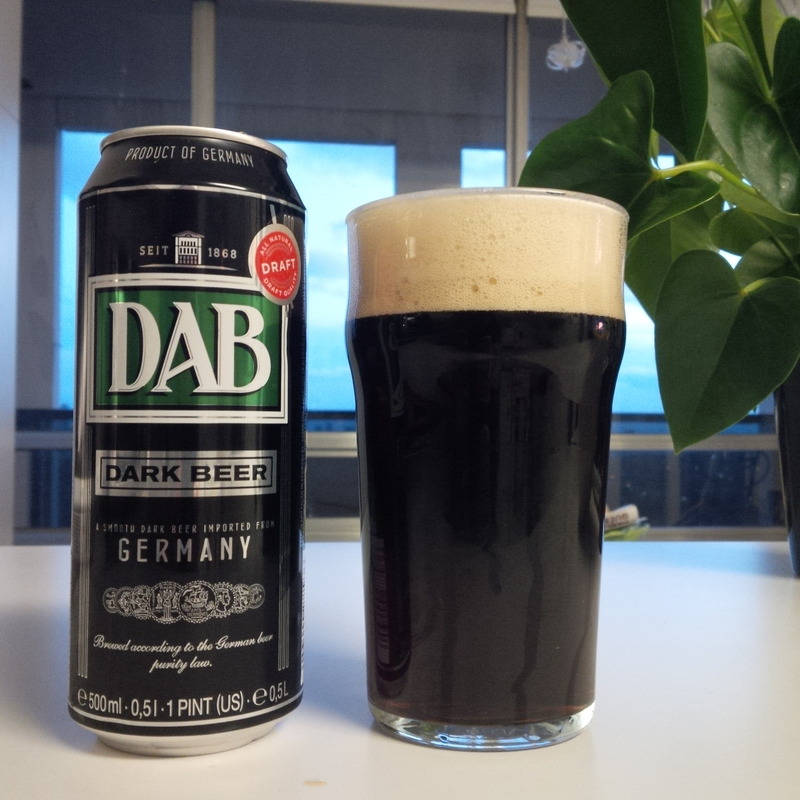 This version of the beer is not available for some reason in Canada. Canadians have a special connection to the bottled stout in that yet a different version of Extra Stout is brewed under license in Ontario and New Brunswick by Labatt (AB-InBev-owned). The first time I had Guinness was in the 1970s in Montreal and it was this version. In Ontario, it is sold in the Beer Store system and you can find it occasionally in a LCBO. This version is IMO not that great, it has something of the Guinness taste but is not as good as the standard imported draft and widget Guinness. Apparently, Dublin sends a flavour extract to distant breweries and when added to a pale base beer, it becomes Guinness. The Labatt Guinness has a slight acerbic note and a burnt-cork taste. I’m told it is popular amongst the Caribbean expatriate community in the Greater Toronto Area. In a world where craft beer, almost always unpasteurized but sometimes filtered, is making increasing gains, offering no beer in naturally-conditioned form or at least filtered but unpasteurized form, seems like odd man out. Guinness should return to the market some beer in a more traditional form, not just because that is what many fans who wish the beer well want, but for its own business reasons. We shall see if St. James Gate has the vision to do this. If it doesn’t, I wouldn’t rule out that Guinness might start to see a precipitous decline in sales along the lines of Budweiser, say. Bud Light is still a big seller but regular, full-strength Bud is hardly the ten league strider it once was. The company should consider in particular, i) returning some Extra Stout to naturally-conditioned form, ii) ditto for all Foreign Extra Stout at least Dublin-brewed, and iii) abandoning pasteurization for draft Guinness sold in Ireland and the U.K., at least in high-turnover locations. At its new experimental brewery in Dublin, it should make draft Guinness to 1800s methods. This means: all-malt, use of unfermented wort to naturally condition the beer, and 1800s-level hop rates. Despite this, I like all Guinness in any form provided it is very fresh. It is still a good beer. I simply feel it could once again become a great beer. 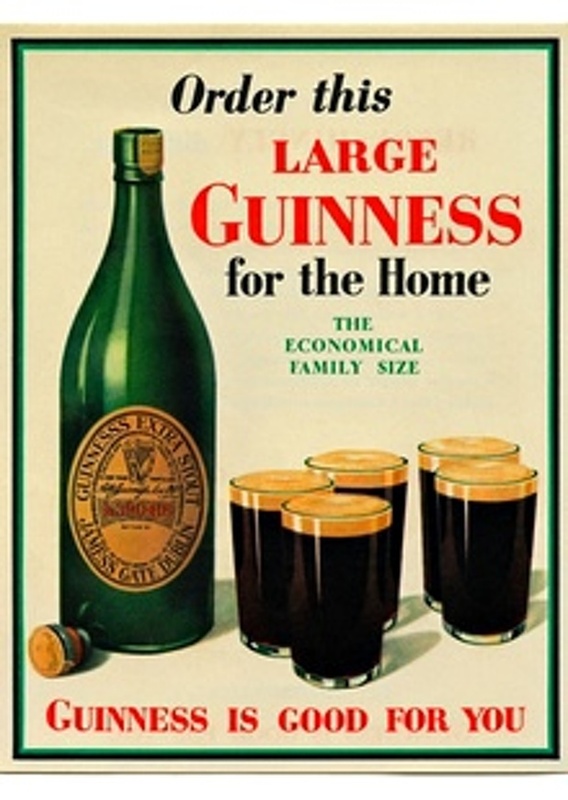 Note re first image above: the charming old Guinness ad is from 1931 and was sourced here. Believed in public domain, but all feedback welcomed. There is something unspeakably seductive and evasive of true description about a first-class Irish stout, it is extraordinarily full and round, mellow and succulent. Yet is it bitter – but that somehow you don’t notice. Behind it and enriching the whole lies that soupcon of strange lactic-like sub-acidity. This infinitely charming beverage compounded of so many different flavours, is most fascinating and wholly characteristic and unapproachable in type. Head and shoulders, so far as universal popularity is concerned, above other brands, stands out Guinness. Some of the other Dublin brands come remarkably near a prototype; but none has, or, at all events in pre-war days had quite full measure of the Guinness touch. 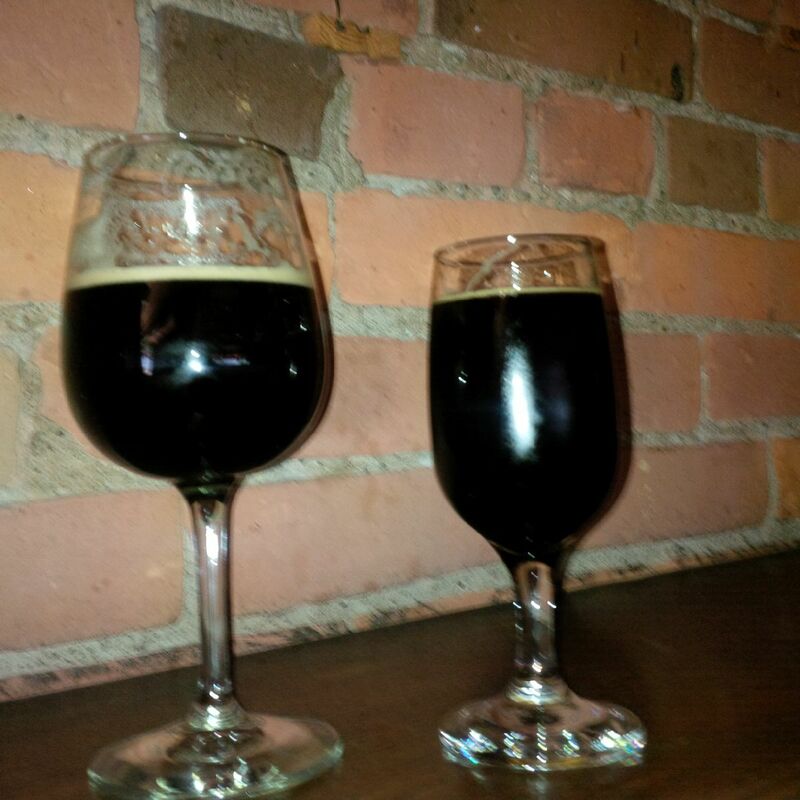 Cork stouts have a delightful soft palatability and a distinction of their own. To the mind of the writer it is the will-o’-the-wisp sub-acidity that does the trick in Irish stout. Take it away and you’ve little left but a black, heavy, dry, but very soft and full mild ale with a lot of hops in it — nothing very characteristic or outstanding. Curious that no one has succeeded in fathoming and grasping that extraordinary suggestion of a rare old vintage wine — something lactic it exposes to us — hidden away in the chocolate-coloured depths….. [T]he home consumption product has a veritable perfection of nicety of balance in this respect: it is indeed a wonderful work of the Art of Brewing. When this was written, Guinness was richer in palate than today. Its attenuation, about 70% in 1861 (70% of the fermentable extract consumed in fermentation), climbed to 85% after 1950, where it is presumably today – you can’t go much higher. In addition, Guinness was 100% barley malt until the mid-1900s – no raw grains. Thus, the Guinness of this lyrical description would have been full-bodied and fairly sweet yet with a vinous élan. The Bacchic touch was attributable to lactic acid produced by extended aging of a portion of the beer in large wood vats. So balanced and perfect in palate was it that the heavy hop bitterness stout was known for was barely noticed. The description gives some indication why Guinness became renowned, not just for beer quality around the globe, but for almost creating its own beer type. Indeed to this day, Guinness connotes not just a brand name but almost a style unto itself. Guinness has released a couple of beers recently which claim an historical heritage, a Dublin Porter and West Indies Porter, but I understand they are not period recreations as such. I haven’t had the chance to try them, but taste notes I’ve read suggest to me these beers, while worthy, don’t aspire to the kind of superstar palate lauded in the 1921 account. If anyone wants to try an experiment to re-create the pre-WW I palate, take any 7-8% abv rich but well-bittered stout provided it has no chocolate, coffee or other flavourings. The English Samuel Smith Imperial Stout, at about 8% abv, is a good choice, but countless craft choices qualify as well, or better. In Ontario, I’d choose Grand River Brewing’s Russian Gun. Then, add a couple of teaspoons of wine vinegar to it. You will notice a nervous acid tone, something you mightn’t even pick up on unless you knew it was there. It may sound odd to some, but “sours” and wild brews are all the rage in beer circles today. 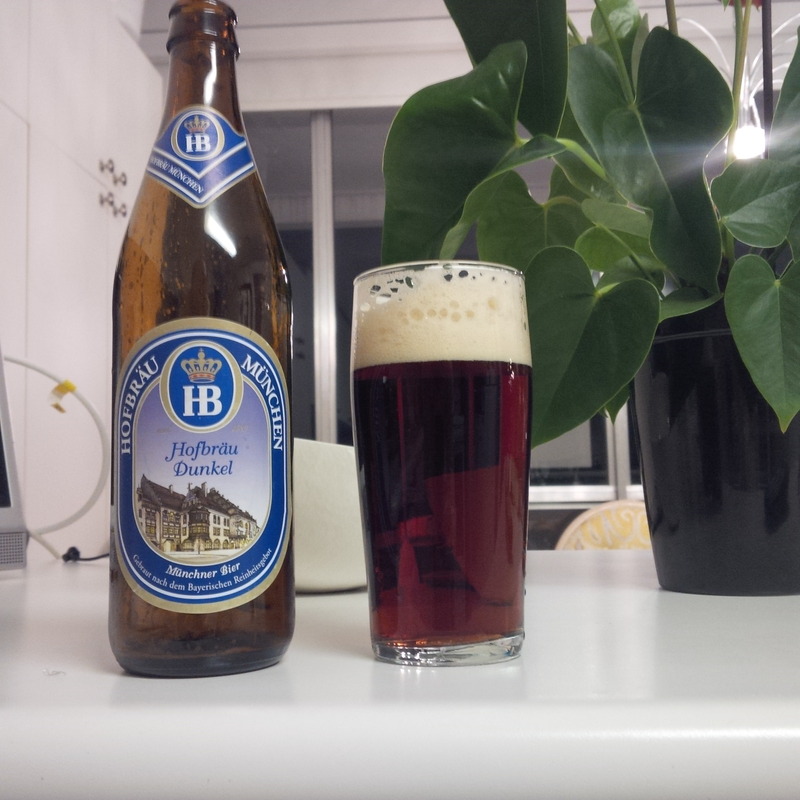 Adding a touch of that character to an otherwise standard beer is eminently historical, and pleasing to many in palate. Numerous fine drinks have this type of effect, certain sherries and the Sauternes, for example. Presumably, Diageo, owner of Guinness, has all the information in its archives to recreate a Guinness Stout of circa-1900. It’s got the spanking new experimental mini-brewery set up. Go to it, team. 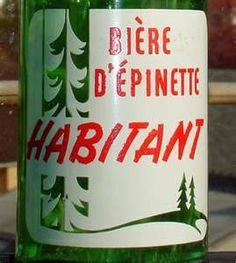 A beverage I didn’t mention in my discussion of poutine yesterday, which is a fine accompaniment to french fries and that genre, is zesty Quebec spruce beer – la bière d’épinette. This is an old Quebec drink which can come in soda form (no alcohol) or with alcohol. Maclean’s magazine recently surveyed the drink and some classic Montreal forms of it, here. It seems clear that early colons from France and possibly indigenous populations were making a drink flavoured with a spruce extract or essence. Maclean’s describes well the taste, sweet soda-and-Christmas tree – thus, lots of fresh pine and resin. This 1880’s entry on spruce beer in an English dictionary has the advantage of explaining what spruce essence is – an extract of the shoots of the black fir tree. It clearly shows too that drinks and beers with this flavour, or one derived from other types of fir, were known across Europe, from England to the Baltic at least. In the early 1970s when searching out steamed hot dogs on the “Main” in Montreal – boul. St-Laurent – I noticed spruce beer offered and one place, the Montreal Pool Room (MPR), offered a home-made version. The MPR still exists, further up the street from the original location, but I’m not sure if the spruce beer is still sold. To my best recollection, the piney stuff came from a pot-stopper bottle, was usually cloudy, and had a strong, natural taste – the perfect complement to a rich dish of chips and “all-dressed” hot dogs (tout garnis mais voyons donc). In Lorraine Boisvenue’s 1979 book on Quebec cuisine I mentioned yesterday, she gives a recipe for a home-made bière d’épinette which involves molasses, yeast and ginger. This would seem an alcoholic version although probably some were quite weak in the ethanol, as for a Russian kvass. There were commercial versions too, from soft-drink companies. Maclean’s mentions a version from Crush, better known for its orange soda – or orange ginger ale as we called it in Montreal. (All pop was “ginger ale” in Montreal then whether ginger appeared in the recipe or not). If I am not mistaken, the Hire’s company, famous for root beer, made a spruce beer too for the Quebec market. I’ve tasted the artisan-style spruce beer shown in Maclean’s piece, at a restaurant similar to the one shown. It was very good although sweeter than I remember the MPR’s version back in the 70’s. 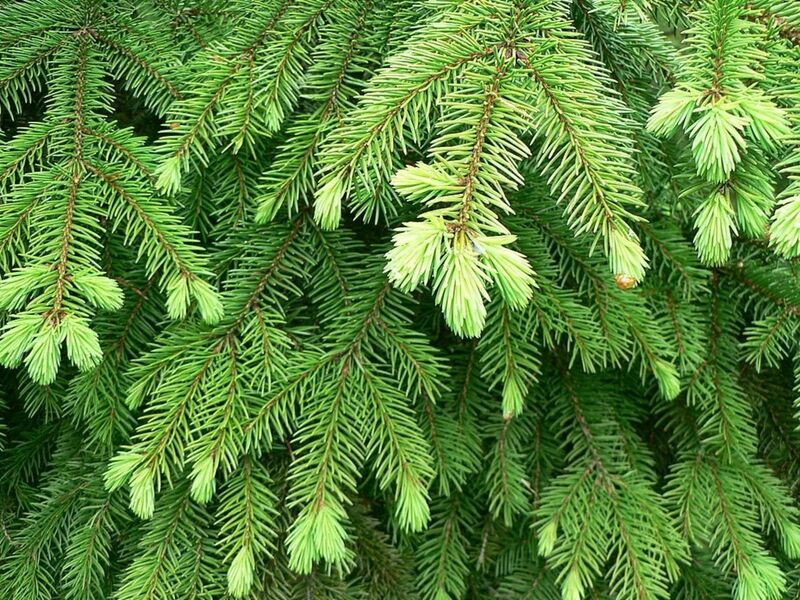 Some of the craft brewers are using spruce in beer, entirely logical given that the sticky substance gave its name to a beer proper centuries ago. If you can’t find any but can find, or make, the soft drink version, pour a few ounces into a good pale ale or IPA. You will get something quite akin to one of the old spruce beers. Note re images used. All are in public domain to my knowledge, all feedback welcome. I’ve wanted for a while to set down some thoughts on the Quebec dish, poutine. Rather than approach it from the standpoint of the history of the dish including the (controversial) origins of the word poutine (poutine in Quebec French), I’d like to give my own experience with the dish, given I was born and raised in Montreal and only moved away in my mid-30’s. Need I say poutine is a mixture of french fries, a meat-based gravy, generally from chicken or beef, and white cheddar cheese curds, the kind that are slightly salty and squeak on your teeth when very fresh. For those interested in the general history and etymology, the Wikipedia entry is an excellent place to start. The information there is accurate based on what I have read for many years elsewhere. I’ll only add here that I believe the term poutine, meaning a group of (often different) things combined, was inherited from one or more regional French expressions. For example, in parts of the south of France, a poutine is a school of small fish. This usage could not have come from Quebec; the contrary is more persuasive. In turn, I believe the French word is probably a venerable gallicised version of the English pudding. The Quebec poutine, before the term became associated with a French fry dish, was used in different parts of Quebec to mean different foods including “poutine à la poche“, described in Lorraine Boisvenue’s Le Guide De La Cuisine Traditionnelle Québécoise” (1979, Alain Stanké Limitée). This dish is included in her “Les Poudings” section and seems a boiled pudding on English lines. English cooking did influence a certain section of Quebec cuisine; still, this does not mean IMO that the word poutine in Quebec is of direct English derivation. If it was, the regional French (in France) usages of the term to mean, in different contexts, a stew, or mess of things (in a technical sense), wouldn’t make sense. All that said, here is my own history with the dish. In a word, when I left Quebec in 1983, I had never heard of it! As one familiar with the fast foods beloved by all sections of Quebec society such as Michigan and steamed hot dogs, but also real Quebec food such as fèves au lard, la cipaille and les cretons, I had never seen anyone eat poutine and never heard the word. Not in Montreal, not in the Laurentian Mountains, not elsewhere in the Province in my travels. This does not mean of course it didn’t exist in Quebec – it did, from the late 50’s, starting possibly in Drummondville, a town within an hour’s drive of Montreal. But Montreal didn’t know the dish including the inexpensive restaurants known as “chip wagons” or the steamed hot dog places on St Laurent Blvd. The modest “tavernes” of Quebec didn’t sell poutine either. They did offer french fries with gravy though – clearly a progenitor of poutine. At some point, the dish migrated from country to town, but how and when exactly is still the subject of ardent discussion and even contention. Before that migration sometime in the 80’s, I am fairly certain that even in staunchly francophone districts in Montreal, no one knew a dish called poutine. If someone did serve it, it would have been a specialty of the house, offered in one or two places only, probably borrowed from something someone saw en province. I first heard of it later in the 1980’s as something you could buy from chip wagons in Ottawa. Ottawa is close to Quebec and counts many francophones amongst its resident and working population, so many typical Quebec foods can be found there or in the Ottawa market. Finally, on returning to Montreal for visits, I noticed the dish on the menus of modest restaurants. Only later – the last dozen years or so – did the dish vault from Quebec and Canada into the international sphere and even into la haute cuisine. This is a most unlikely fate for any Canadian food but especially one as humble as poutine. Still, there is no accounting for these things. The rise of poutine is somewhat like the ascension of Buffalo chicken wings or much earlier, the Caesar salad, the hamburger. Etc. Some things go around the world and become culinary fixtures. Others fizzle out – chicken in the basket with honey, say. But poutine and “wings” seem destined to endure. I can count on the fingers of one hand the times I’ve had poutine. The best time was the first, from an Ottawa chip wagon – it was very good of its kind. I had it once from Harvey’s, the Canadian hamburger chain – pas si bonne, in my opinion. I may have it had twice more. It’s very caloric and sinfully rich – but then so is foie gras, I guess some would say. Originally, Quebec cuisine was a fascinating inventory of old French dishes, e.g., the wonderful tourtière, a seasoned meat pie in a crust, and old English dishes, e.g. cipaille, which I wrote about years ago in Petits Propos Culinaires, an English food journal despite the French name. Cipaille – there are different spellings – derives IMO from the English seafaring dish, “sea pie”. Later, Italian, Greek and Jewish traditions contributed other elements: pizza, bagels, smoked meat, souvlaki. And so on in a wider arc today given the multi-cultural nature of Quebec society. Poutine cannot – in my view again – be counted on a par with any of these. But it put Quebec on the map so to speak, and who can quarrel with that. N.B. As a blog generally devoted to the study of beer and sometimes other drinks, one might wonder what I think pairs with poutine. Admitting again my relative unfamiliarity with the dish, I think soda pop is best. The dish originally was just french fries, and then fries and gravy (or fries and just the cheese curds in one account), and finally poutine as we know it. The chip wagons sold no alcohol, all the classic pops were the choice for french fries, les frites. And pop goes well with the derivative version of fries, poutine. Beer of course does too – here I’d hazard that a mainstream brew is best, not a richly hopped or malted craft beer. Quebec cider certainly goes well with fries, and possibly is best of all drinks with poutine. I suppose some would bruit sparkling wine or some kind of still wine, particularly with the kind of poutine that four star chefs work up. In the end, perhaps it doesn’t really matter what quaff goes with poutine, as long as it is wet and cold. Sleuthing has unearthed further information on Billy’s (the correct spelling it seems), a long-established Manhattan bar and restaurant. 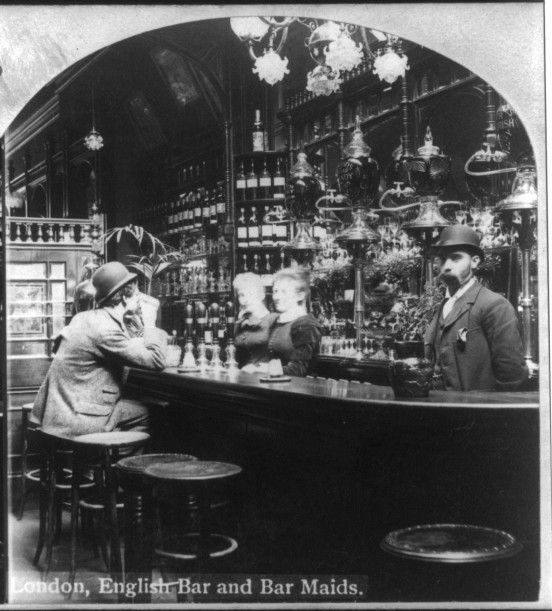 I discussed the bar yesterday, including that a 1936 photo of Billy’s shows 1800s-era handpumps on the back bar. Billy’s was founded in 1870. Initially it was on 1st Avenue approaching 56th Street, then on the southeast corner of that intersection, and finally moved three blocks south, near 52nd Street. Unfortunately it closed in 2004, a run of 134 years. 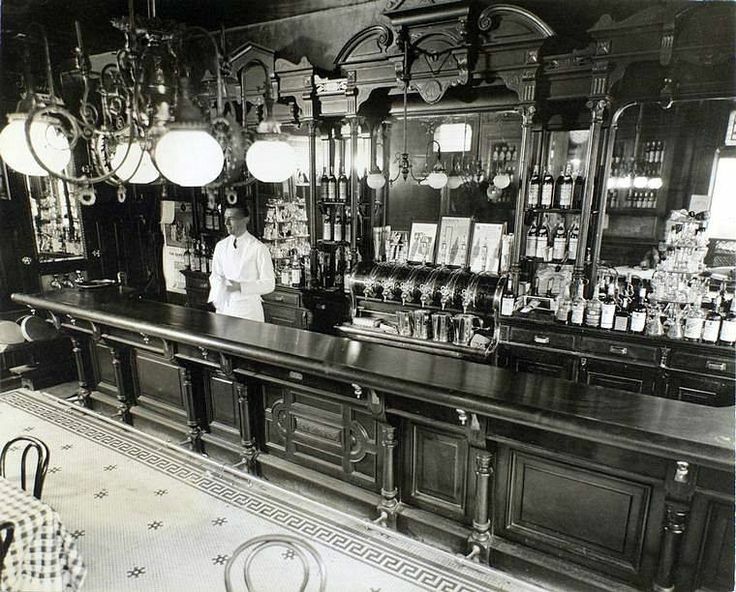 My speculation earlier that in 1936 the bar’s furnishings dated from pre-Prohibition times is undoubtedly correct, given the founding year is 1870. The food and restaurant writer, Ruth Reichl, reviewed Billy’s 21 years ago for the New York Times, see here. This is likely how it was until closing in 2004. In the Victorian image below, we see the same kind of hand pumps Billy’s still had in place in 1936 in busy Manhattan, which it probably installed in 1870. Nothing in Western culture connoted greater modernity than the New York of George Gershwin, yet as always, past and present are interwoven. (The past isn’t even past, William Faulkner said). Hand pumps can be seen to this day in hundreds of English pubs and are used in exactly as in Victoria’s time. Many American and Canadian beer bars have brought the equipment back as part of the retro ethos in craft brewing. Note re image: the image above was sourced from the Internet and believed in the public domain. All feedback solicited. Above is a selection of bitters, which in this case has nothing to do with beer. Bitters is a European-origin beverage, fairly strong (25-50% ABV), compounded of alcohol, sweetening, and flavourings which may be spices, herbs, fruits and/or barks and plants. Generally they offer a bitter-sweet palate and often are intensely flavoured. Angostura’s and other cocktail bitters are a special class of bitters, not a beverage as such but with a not dissimilar set of flavours. Typically they are used in the Manhattan and other cocktails. Amaro is an Italian class of bitters, there are numerous brands. The fruity-bitter Campari is also well-known, generally used with soda as an aperitif or mixed with gin or vodka. 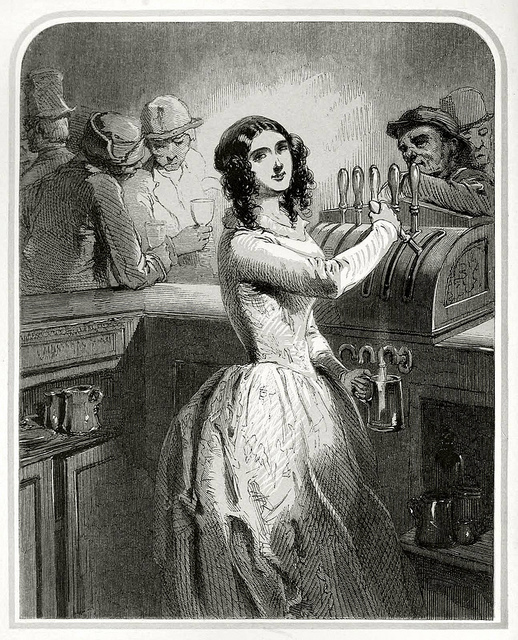 The bitters on the right in the image is an absinthe bitters, from the reputed J.C. Baczewski. The house is or was a well-known Polish distiller but I think is based now in Austria. The bottle was bought in Ontario some dozen years ago and isn’t carried currently by LCBO, so I’m not sure if the brand is still made or where. Even though “vodka” appears on the label, it isn’t a vodka proper albeit the “little water” figures in its composition. The style of the drink is called Piolunowka. Wormwood and other herbs, those associated to absinthe proper, do figure in most recipes. The herbs are allowed to macerate in strong spirit vs. being distilled to aromatise them, therein lies the difference with the famed Green Fairy. As well, Piołunowka has a sweet side most absinthe does not. Maison Baczewski must add honey since there is an unmistakable scent and taste of the beehive, almost like a sauterne. It is very good, bitter-sweet, herbal, not anise-like in this case. I only take a thimbleful at any one time – just a little is enough. 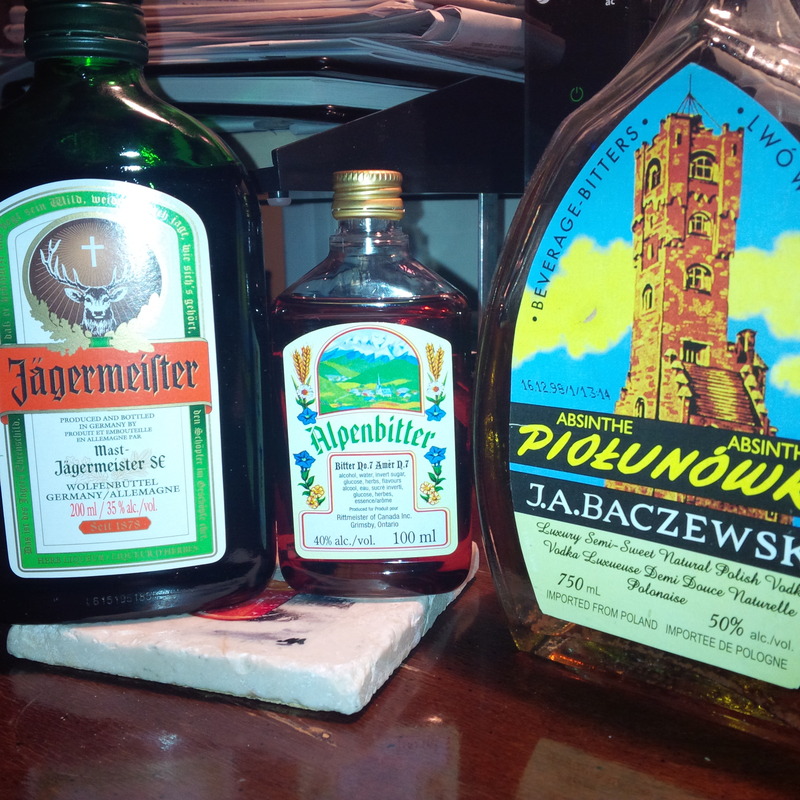 The two new bitters in my stash are the famous Jagermeister, which I had never had before, and Alpenbitter, a local (Ontario) brand which presumably follows a Swiss or German recipe. I assembled these to have a small group for comparison purposes. The Jagermeister is excellent, repeated stories of its bad taste simply aren’t true – at least not to those familiar with the nuances of the alcohol palate. I’d guess the back story of bad taste, medicinal, etc. is a form of praise, using irony that is. In truth the herbal taste is really not much different to a root beer. Still, it’s kind of a cool story in a way, the famous drink that doesn’t taste great, it has a guerrilla kind of appeal. Jager tastes very much like a Manhattan cocktail, or a Sazerac if you sweeten it and go easy on the anise. The Alpenbitter is honeyed with a good herbal note, different again from these other two. Perhaps it falls midway between them, in fact. I know that Jager is regarded as a specific – an old word for a hangover cure, but it easily fulfills a much more pleasant office, say an ounce next to a chilled pilsener, or late at night before retiring. The image above is slightly overexposed which gives it a 1960’s day glo effect, as in photos or merchandising from the era. Kind of appropriate in the context of all that alcohol and exotica of herbs… But Beer Et Seq will experience no psychedelic visions. Modest sips are the way to go, the flavours are scoped, and a little more is learned from l’univers des alcools.